The United States under President Donald Trump looks increasingly chaotic when it comes to foreign policy. Of course, internal issues also blight the Trump administration but part of this is based on anti-Trump intrigues and the role of the mass media in America. However, when it comes to foreign policy, the resignation of General Jim Mattis is a severe blow to Trump and the people of America because external lack of trust is growing. The final straw, it appears, is the sudden announcement of American military forces leaving Syria. 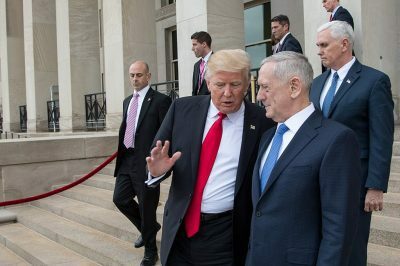 Mattis had hoped to persuade Trump to at least keep a residual force on the ground in Syria. Equally, Mattis fears that Turkey will seek to crush allies of America, for example, the Kurds in Northern Syria. Therefore, being unable to persuade Trump, the respected Mattis resigned. It is incumbent on Trump to take a look at the revolving door that is swinging open to new sackings or resignations. If Trump can’t find loyalty within the ranks – while being open to listening deeply to differences – then his administration will continue to look weak and unreliable. Hence, Trump needs to the steady the ship before it sinks beyond repair.